The youth vote has long been a desirable little political prize (which is why Republicans make really embarrassing ads that look like this), but motivating young voters to turn out in the midterms and vote for what is often a menu of bad options can be a challenge. 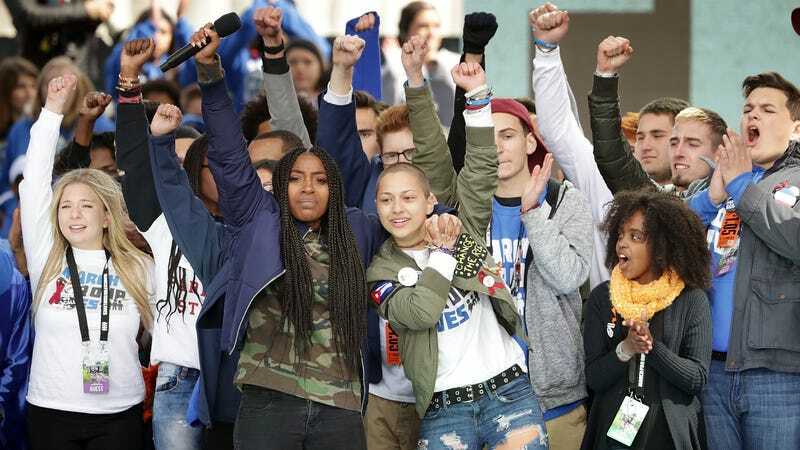 This year, the teens leading the newest wave of gun control activism are trying to change that. In North Carolina, voters under 25 represented around 30 percent of new registrations in January and February; in March and April, they were around 40 percent. In Pennsylvania, voter registrations across age groups increased sharply in March and April before the primary last week, but registrations of young voters increased the fastest, jumping to 45 percent in March and more than half in April, from fewer than 40 percent of voters in January and February. These new potential voters lean Democrat; this is unsurprising if gun control is a big issue for the 26 and under crowd, which it is: An April 2018 poll indicated that nearly two-thirds of American adults aged 18-29 who plan to vote in the midterm election believe gun control laws need to be stricter. According to the United States Election Project, only 20 percent of registered voters under 30 actually vote in midterm elections. As the Parkland teens and their allies continue to mobilize for gun reform, there is no shortage of urgent, painful reminders about the need to act: The May 18 school shooting that left 10 dead at Santa Fe High School outside of Houston. You can’t remake the electoral map overnight, but if the NRA and its political shills are even slightly afraid of the youths, then they’re doing something right. Check out the full report at the New York Times.